Yeeeup. No matter how many photos I took, what colour cardigan I wore or place I went or slouch I affected, yellow is not the kindest colour I could wear. I try to think of this print as a 'soft orange', but the yellow just wont be my friend. Dammit. I bought this fabric at Liberty in London and then made up a Gabby as a top. And found out that fabric such as Tana lawn is NOT suited to the Gabby; waaay too crispy crunchy, stands out like a maternity blouse. And worse! I made it 2 sizes too big! By the gods what a wretched life is this for I was born to sorrow; horror, thy name is yellow. Do stay tuned. I think I'll format this post as in reverse order so newest entry is always at top of page. Tomorrow will be a better day. Smiley face. Ok so above pics are from today, May 24th, NOT May 23rd. 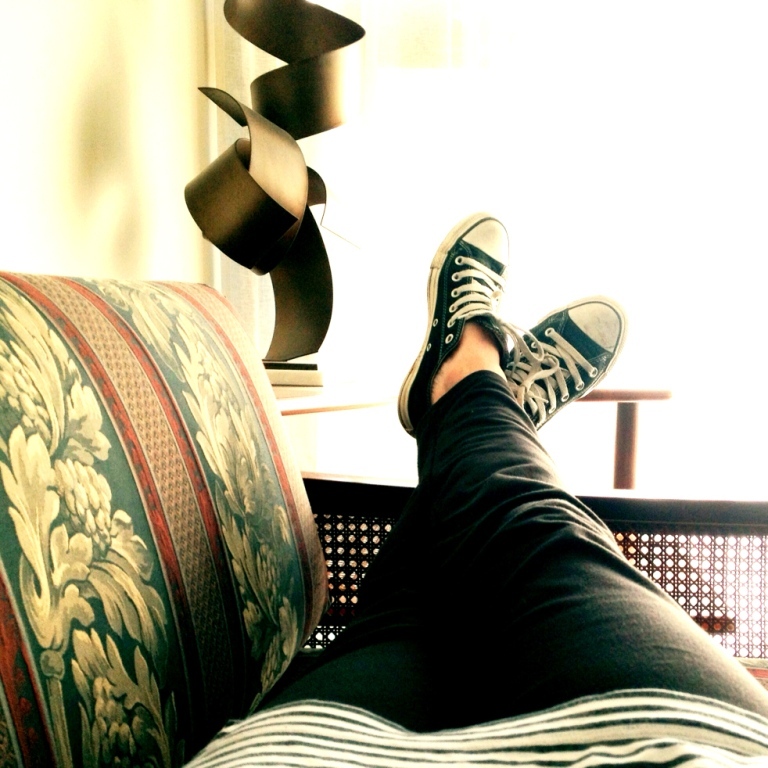 And I wore my Anita Ponte Pants. Again. And I haven't downloaded yesterday's pics at all yet...I'm slacking off and we're nearing the finish line! But Me Made May is not a competition. Yeah right, as long as its me winning its not, and since I'm in direct running against myself, the finish line aint gonna be pretty, man, it'll be a bloodbath. Yeah you got it, BLOODBATH. The home sewist, a gentlewoman ASSASSIN. Pass the crack pipe, mofo's and outta the way, I got outfit planning to do. I am also a dickhead so y'know, I'll writhe in shame when I re-read this tomorrow. And then delete it. Heh heh. Oh. Actually here they are. May 23rd in all its half-arsed glory. Now I can avoid that shame occasion tomorrow. Double heh heh. I like this pattern; with the way the seams are cut, the fabric hangs inwards at the sides giving a nice, flattering shape but unfortunately, even though the fabric style (retro type embroidered dots) suits the pattern, the fabric itself doesn't drape at all. I plan to make another with a lightweight ponti/knit or soft stretch cotton. Still, it's a fun dress to wear. May 25th however, is a Laurel dress as a tunic with a fabulous kerayzee print but I think the fabric is actually made of plastic. Shame, I dont wear it as much as I'd like to, the pure poly is kinda icky. Style before ease but not on a Sunday. Hey, it's Sunday! Time for PJ's. I would like to make something new, May is nearly done and I'm tired of all these old clothes! But I'm deeply in love with Me Made May, I have found some cracker new friends and blogs! So Granny Corner will now do a me-made post once a month or so and theres always the super fun Instagram, huzzah. 26th May, a fabulously paisley-ed silk top, fabric from Tessuti, pattern Simplicity 2308. Worn with black & white houndstooth mini, not me made. Its an interesting fabric though, the black pattern is flocked on so its a dimensional thing, make eyes go funny like. The silk is very very fine and does crush but I love this print. Interestingly, today I happenned to read The Guardian, fashion section, & there was this article about how paisley is THE thing right now. Yes. So hot right now. Lauren Laverne writes of "...an adventurous aesthetic involving eye-popping prints in earthy tones, wearable midis and luxe combinations of silk and wool." Goody. My favorites. Movin right along, May 27th, a good ol' Missoni. 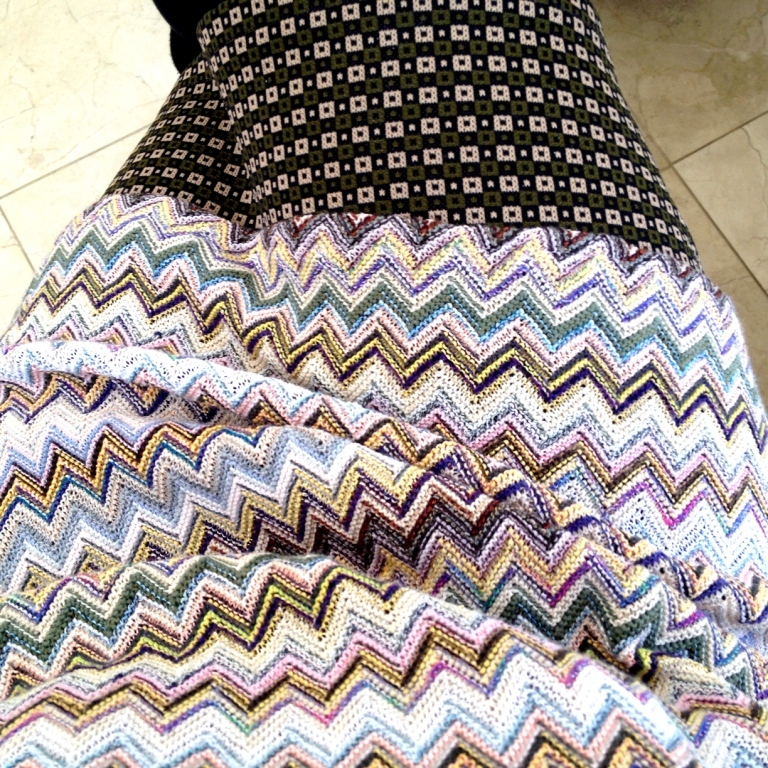 I have a thing for Missoni. I love it & fortunately for me, Tessuti provides. Tessuti: my happy place. True! Its taken me quite a few (many, many swear-y words) trials & errors to get the knack of sewing these knits but it's a knack I've attained now. More or less. Cinco de Mayo pendant from Lost Apostle on Etsy. May 28th and I'm wearing a Tessuti "Fave" top, black Style Arc Elle pant & prototype (which makes it sound grand) of headband/head-piece I've been messing around with. Maybe needs to be a little bigger to match scale with my hair. I'm so close to God with my hair. It fits! And I wear my black cardigan anyway! This is a dress which I have to say is the best dress I've ever made. I love it and it took TWO toiles & numerous adjustments and it hangs just so. 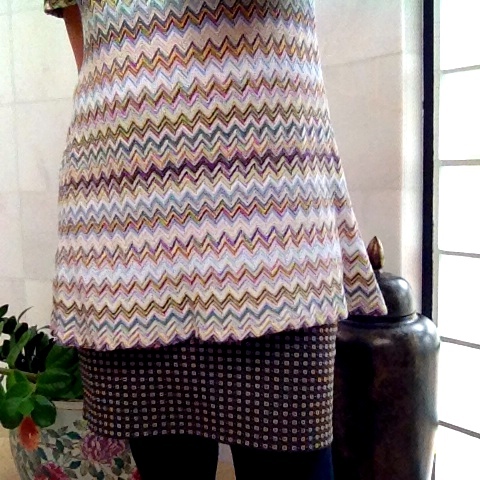 No darts or nuthin, just my favorite favorite classic Missoni cotton knit. Blessings be upon Tessuti. Really. Aaaaand May 30th, I'm missing my not-me-made clothes! And I'm kinda done with photographing myself everyday. I had only pledged to wear me-mades for three, maybe four, day per week but I had grossly under quoted the amount of garments I had made, so I decided during the first week of mmmay to go for everyday. And I've done it, easily, with still choices left! This, I unexpected. But I really love some special pieces of RTW and miss wearing them but its nearly time done. 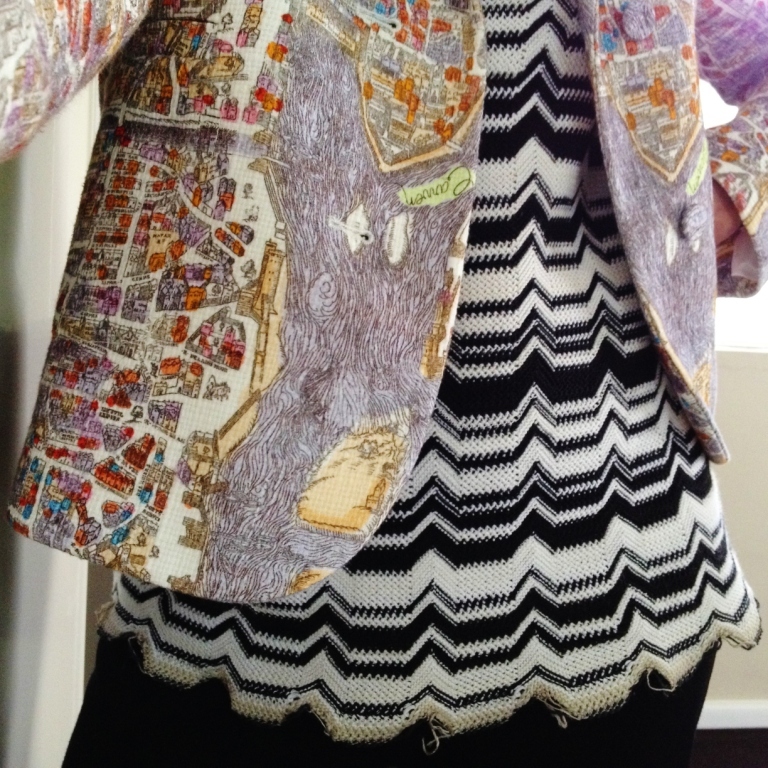 This second last day though, I just had to wear my amazing-greatest-jacket ever purchase from My Wardrobe, my brilliant Carven blazer, below. How I love it. And yes! 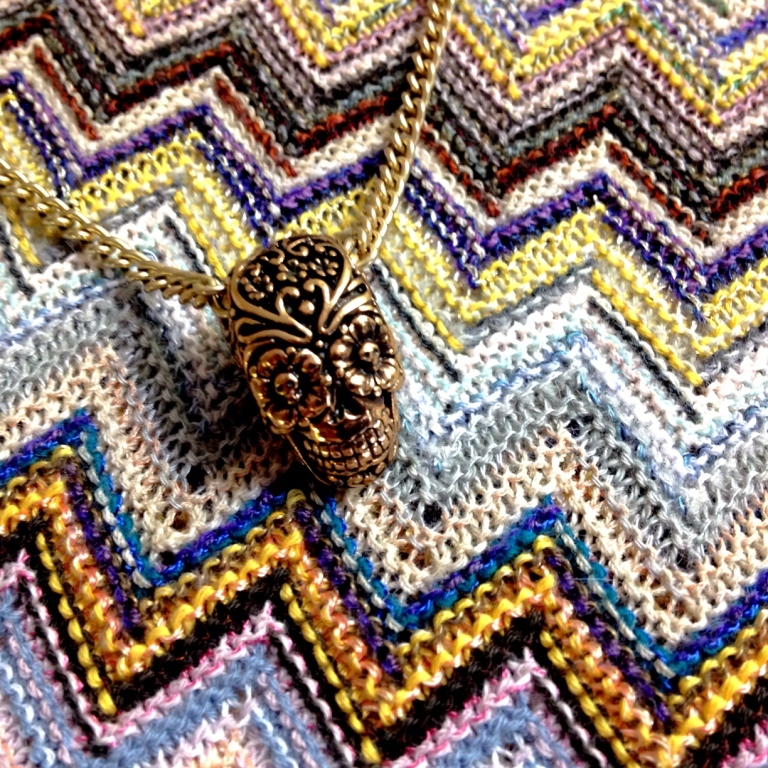 Wear it with more Missoni home sewing! The knit is a different pattern, but the it's same Missoni goodness. Its May 31st! Its May 31st! And thusly we mark the end of my first Me-Made-May. As you can se in the photo below, I really should get back into studio, now the daily dressing assault is done. Its been fun, playing with outfits & meeting cyber-friends and I have a new respect for my wardrobe, given how many of the more interesting garments are me-made. I make some really cool stuff and always with fabric I really love. I would never buy fabric without loving it but the same could not be said for rtw clothing. So what I end up with is "practical fashion". Stuff I wear regularly, on a daily basis. 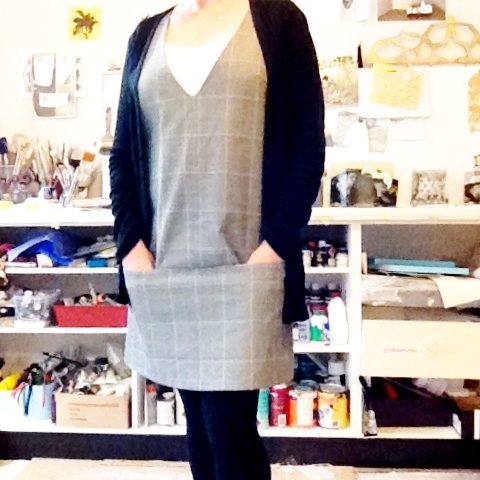 This pinafore style dress, below, happily meets my practical fashion criteria, that is, I made it and its great for studio work and actually stepping out in public. I would never do this with a rtw garment, but with my own stuff, I feel a lot easier about really using it, actually wearing it without need ing to 'save it' for some far -off dress-up time. So this pinny dress is like wearing dress style overalls, how cool is that? Its a stiff-ish almost canvas plaid fabric, reassuringly sturdy and I am definiltly going to make more of these. So handy! The thing is, as a teenager, home sewing was not something I discussed, I was embarrassed by it; I had to make my own gear because there wasn't money for fashion & I craved it. I craved fashion. So I had to make my own. Now, maybe 30 years later, (yes, I've been sewing aaaaaall that time) it seems that as home sewing is now regarded as 'sustainable', as a practice, it is wildly popular. I like this. There's some really great sewists out there and I can have sewing conversations! Sewing & fashion! I love it. And now I have an Instagram habit, which is incredibly fun. Furthermore, now I have honored my MMmay Pledge, to NOT buy and new patterns or fabrics during May! (I'm being sustainable) It was so hard to do this one, with all the enthusiasm & inspirations posted daily, I swear, it was so hard! HARD to resist. So I can lash out now! First up a couple of fast satisfactions, a Coco dress, followed by Belcarra blouse, oh man have I been keen to get/make these. Then a Julia cardigan (cardigan!) and for when I'm truly bold, a Rigel Bomber. Maybe even a Bombshell. And THEN, I hit Tessuti BIG TIME. Hold on. And then I get back here too.